In previous blog posts I’ve mentioned some terms like “65xx ISA” and “Addressable Register Architecture (ARA).” I suspect most software engineers have conceptual knowledge of instruction sets and their classification. As an example, the x86 instruction set is much more complex than the reduced instruction set of the ARM. This is where the terms CISC and RISC get thrown around and most conversations end. I felt compelled to do more research to deepen my conceptual knowledge and find out where ARA fits in the landscape of ISAs. That’s my goal of this post. If you’re looking for something more in-depth then you’ll likely have to keep looking but check out the Fun Facts before you go. A special thanks to my uncle Bill Mensch for providing information on ARA and tolerating my basic knowledge questions. ARA gives 65xx ISA a unique identity which is neither CISC nor RISC. So, in my “layman’s world” I think of ARA as an ISA that is the “best of both worlds” sitting nicely in between CISC & RISC. This is where I leave you to continue exploring and digging deeper if you desire. This is a fascinating world that is extremely complex. Before you leave, take a look at the Fun Facts, I think you’ll be surprised! Fun Fact #1: Did you know that a microarchitecture has more affect on power, energy and/or performance than instruction set architectures, e.g. CISC or RISC? Here’s a great EETimes blog post (RISC vs CISC: What’s the Difference?) that reveals this finding of a 4 year study from the Vertical Research Group. …Bill respectfully declined to design the 32-bit microprocessor for the ARM engineers. Fun Fact #3: The 6502 made an appearance in the first Terminator movie! The T-800 HUD (Head Up Display) features 6502 assembly code. It was determined to be Apple-II code taken from Nibble Magazine. (http://www.pagetable.com/?p=64) The feature image is from the T-800 HUD. This is the second installment in a series exploring 65xx technology. My first post was a high-level introduction to the W65C265SXB and a wonderful little gem called the Monitor ROM. Now it’s time to take the next step and blink the LED (P72) on W65C265SXB, which is located in the middle of the board just above the W65C265S 16-bit Microcontroller chip. Blinking the LED in the embedded world is synonymous with writing a “Hello World!” program in software. I’ve written many “Hello World!” programs over the years in numerous programming language however, those pale in comparison to controlling something tangible like an LED at the lowest level. I might be able to guess your reaction to this list… “c program, not a big deal…I just need a little time to get back up-to-speed”, “assembly language, ah, hmm…I’m sure I can find some examples on the internet”, “S28 record, what is that?” and finally “opcodes, that sounds hard!” I’m going start from the ground up by using opcodes. Why? Well, I believe the best way to an understanding of how to program 65xx technology is to start with a simple exercise at the lowest level by talking its language, i.e. machine code. Software engineers gain in-depth knowledge of their tools and high-level programming languages over years of experience. However, few engineers seek to decode the output of a compiler (e.g. Assembly language or machine code) or hexdump of an executable mainly because it’s unnecessary, which I agree. I’m going to provide you with a glimpse “under the compiler” in order to gain a deeper level of understanding. If you haven’t been here before, enjoy this new world that’s been here all along. So, lets get started with a quick review of the Monitor ROM. As I mentioned previously, the Monitor ROM (aka Monitor or Mensch Monitor) provides you with an interface into the mask ROM of the W65C265S. The Monitor was designed specifically for the W65C265S and it resides in the 8K byte mask ROM. The Monitor is the main reason why I decided to first buy the W65C265SXB over the other boards. I think of the Monitor like a Bash shell for the W65C265S. It behaves more like a REPL with its rich interactive environment to load, run and debug programs. Moreover, I like the idea of having a board with a built-in tool to assist with learning the technology. I simply need a terminal application, usb cable and board. 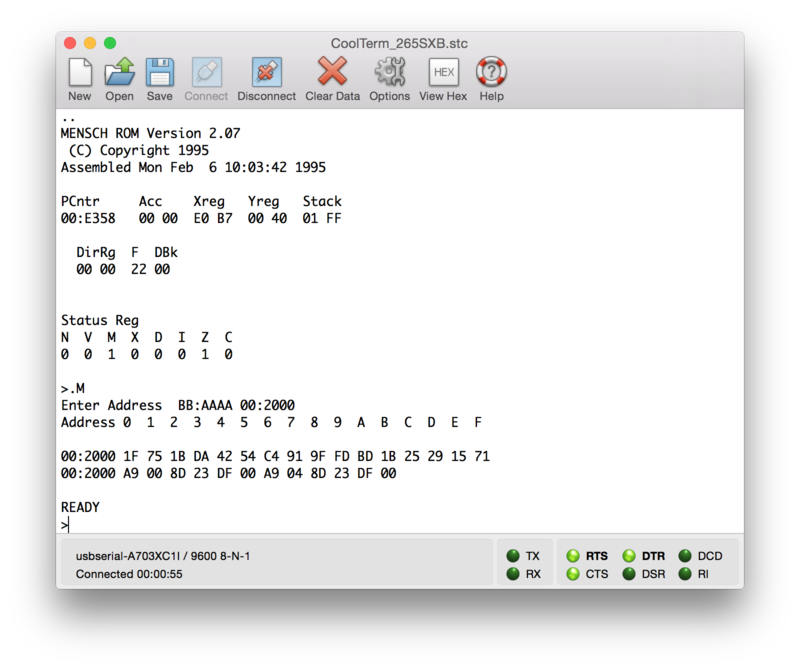 CoolTerm is the terminal application I’m using to connect to the 265SXB via the J5 USB connector. 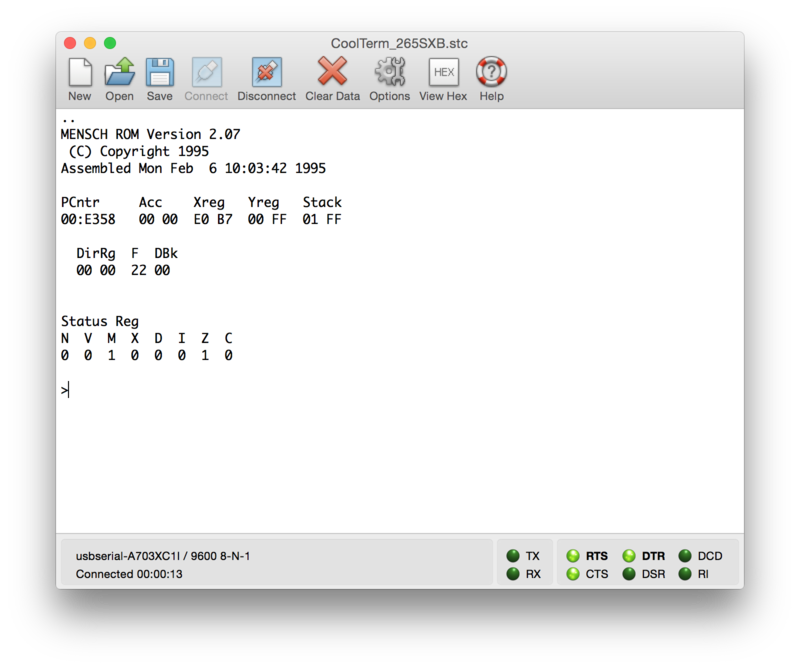 CoolTerm is great cross-platform terminal built for communication with hardware connected to serial ports. 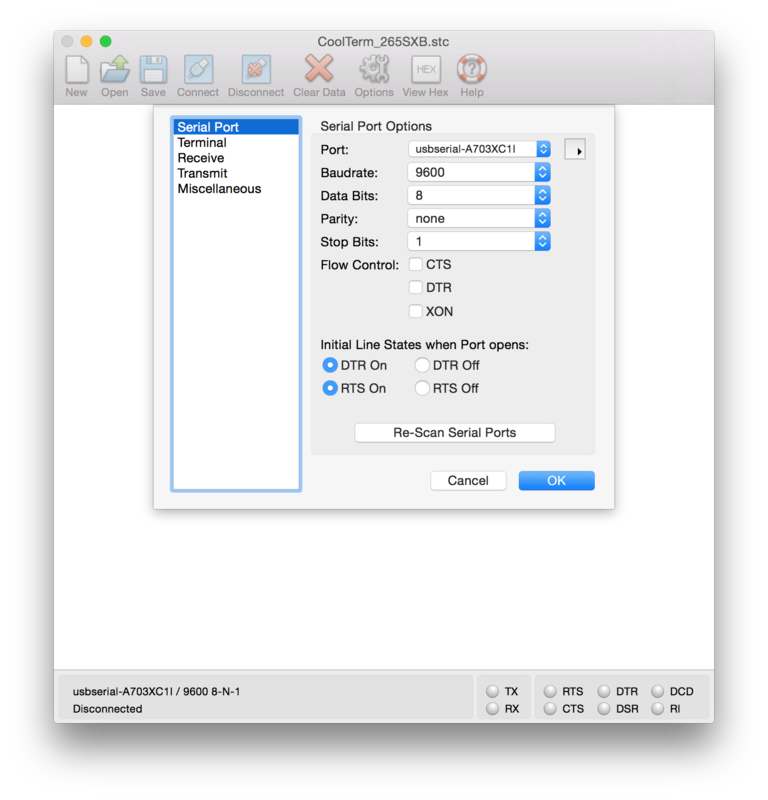 The default serial port options in CoolTerm work the 265SXB. You will have to specify the port where the board is connected. If you do not see the connected port in the dropdown list simply click on the Re-Scan Serial Ports button to re-populate the Ports list. Once you have CoolTerm configured, simply click the Connect button and you’ll see one ‘.’ in the upper left corner of the screen. Also, the bottom footer will indicate ‘Connected’. Then press the Reset button (RESB) on the board and you will see the initial screen of the Monitor. Ok, our tools are setup and we’re ready to go! I really like the simplicity. Yes, that’s right opcodes (aka machine code)! We don’t need no assembler! Well, not for this simple task. Opcodes (operation codes) are individual instructions from a machine’s language. A machine’s language is defined by an Instruction Set Architecture (ISA). So, since we’re working with 65xx technology we’ll be using instructions from the 65xx ISA called ARA (Addressable Register Architecture). The 65xx ISA was used to define RISC within the Microprocessor Report many years ago. According to the datasheet, we’ll be writing our opcodes in cache memory locations within $00:0200-$00:7FFF. Great, but where is that exactly? You can find the chip set on the board labeled “32KByte SRAM”. Enter 002000. This is the starting memory address. Enter the following 12-byte sequences of hex characters and then press Enter. Congratulations! You just turned an LED on/off with machine code, woot! Now lets understand what we’ve done. The ‘M’ command (Change Memory) is used to view and change data in memory locations. So, when you entered $00:2000 you will see 16 memory locations starting with $00:2000 and ending at $00:200F. When you entered the 12-byte sequence of hex characters you modified memory locations $00:2000 through $00:200B. In other words, you loaded your program into memory. The ‘J’ command (Jump to subroutine) executes a program in memory. We actually have two programs in memory; one starting at location $00:2000 and the other starting at $00:2006. When you entered ‘J’ then $00:2000, the first program executed from $00:2000 and stopped at $00:2005 hence turning on the light. When you entered ‘J’ then $00:2006, the second program executed from $00:2006 and stopped at $00:200B hence turning off the light. If you take this listing and assemble it then perform a hexdump you will see the 12-byte sequence you entered earlier. 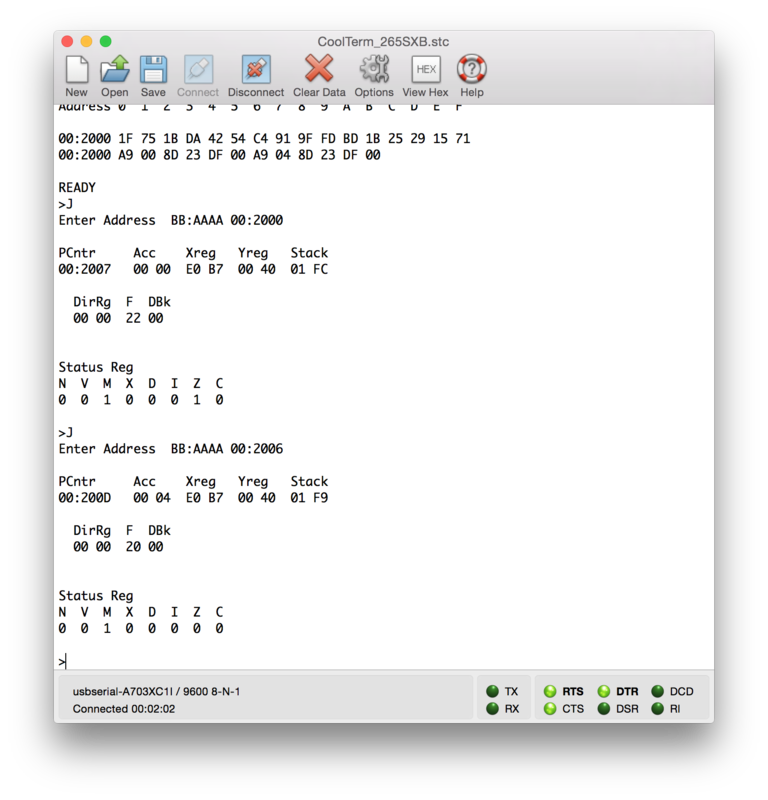 What really helps tie everything together is to disassemble the assembled listing and you’ll see the association between the opcodes (hexdump) and assembly language. I used the Easy 6502 assembler to disassemble the listing. The address locations are different in the Easy 6502 simulator than on the 265SXB so you can ignore the Address column. Now the relationships should be very clear. I’ve seen the “light” and now I’m hooked. So, what else can this board do? I’m a software engineer working as a consultant for Chariot Solutions developing software solutions for clients to solve business problems. My path to becoming a software engineer started in hardware specifically integrated circuits while working at the Western Design Center (WDC) in the late 1980’s. It was at WDC where I learned how to layout circuits in a work-study program while studying Electrical Engineering at Arizona State University. Later, I changed majors and finished school with a B.S. in Computer and Information Sciences. The last few years I’ve been focused on mobile applications primarily developing native Android applications. It’s very satisfying building apps that run on devices that you can hold in your hands. A refreshing change from building enterprise server-side software that runs on virtual machines in a cloud located somewhere on this planet. I still enjoy developing apps for mobile devices however, I find myself wanting to get back to my roots and get “closer to the metal”…to quote my Uncle Bill Mensch who taught me about integrated circuits years ago. Uncle Bill and I continue to stay in contact and have had many discussions on technology, philosophy, Embedded Intelligence, business, and family. So, I’m one of 11 million professional software developers in the world today. My goal is to explore 65xx technology and share my experiences through the eyes of a software engineer. The first step starts with the W65C265SXB. What is a W65C265SXB? The W65C265SXB (Standard chip Xxcelr8r Board) is a board designed for developing Hi-Rel (High Reliability) low-power applications for the W65C265S microcontroller. You can read about all the features of this board in the datasheet. WDC explained to me that their microcontrollers are general purpose making them ideal for use in industrial control systems, e.g. weigh belt conveyor systems, industrial refrigeration, access control, general communication, etc. The W65C265S is built on the 65xx Instruction Set Architecture (ISA), which is a very efficient ISA (benchmark comparison). Most microcontrollers today are RISC-based like the Atmel ATmega328 used in the popular Arduino Uno board. The difference in instruction set architectures is an important distinction. There are many RISC-based microcontrollers in the market however, there are only two (W65C134S & W65C265S) that are based on 65xx ISA. The W65C265SXB is based around the W65C265S which is a feature rich 8/16–bit microcomputer based on the W65C816 microprocessor. …my board comes alive. 🙂 What you’re seeing is the initial output of the W65C265S internal Monitor ROM. The monitor acts as a simple operating system, allowing the user to examine registers and memory, load and save programs, and debug applications in RAM. The Monitor provides you with an interface into the mask ROM of the W65C265S. The Monitor was written in Assembly language (code listing) in the early 1990’s. As a software engineer, I find this pretty amazing that a simple operating system written in Assembly over 20 years ago can still be a valuable asset!